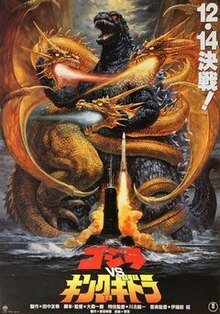 Godzilla vs. King Ghidorah (ゴジラvsキングギドラ, Gojira tai Kingu Gidora) is a 1991 Japanese science fiction tokusatsu kaiju film featuring Godzilla, produced and distributed by Toho. The film is written and directed by Kazuki Ōmori and is the 18th film in the Godzilla franchise and the third film in the Heisei series. The film was released in Japan on December 14, 1991 and direct-to-video in North America in 1998. Although the film's production crew remained largely unchanged from that of Godzilla vs. Biollante, the previous film's financial disappointment, due to a lack of child viewership and alleged competition with the contemporary Back to the Future franchise, compelled the producers to create a more fantasy-orientated picture with elements of time travel included. It was the first Godzilla film to feature a newly orchestrated score by Akira Ifukube since Terror of Mechagodzilla, and although much more successful than its predecessor, the film became controversial in the United States due to perceived anti-Americanism stemming from a scene where Godzilla kills several American soldiers. Columbia TriStar Home Entertainment released Godzilla vs. King Ghidorah and Godzilla vs. Mothra on DVD in 1998. In 1992, science fiction writer Kenichiro Terasawa (Kosuke Toyohara) is writing a book about Godzilla and learns of a group of Japanese soldiers stationed on Lagos Island during the Gilbert and Marshall Islands campaign. In February 1944, while threatened by American soldiers, the Japanese soldiers were saved by a mysterious dinosaur. He theorizes that the dinosaur was subsequently mutated into Godzilla in 1954 after a hydrogen bomb test on the island. Yasuaki Shindo (Yoshio Tsuchiya), a wealthy businessman who commanded the Japanese soldiers on Lagos Island, confirms that the dinosaur did indeed exist. Meanwhile, a UFO lands on Mount Fuji. When the Japanese army investigates, they are greeted by Wilson (Chuck Wilson), Grenchiko (Richard Berger), Emmy Kano (Anna Nakagawa) and an android, M-11 (Robert Scott Field). The visitors, known as the "Futurians", explain that they are humans from the year 2204, where Godzilla has completely destroyed Japan. The Futurians plan to travel back in time to 1944 and remove the dinosaur from Lagos Island before the island is irradiated in 1954, thus preventing the mutation of the creature into Godzilla. As proof of their story, Emmy presents a copy of Terasawa's book, which has not yet been completed in the present. The Futurians, Terasawa, Miki Saegusa (Megumi Odaka), and Professor Mazaki (Katsuhiko Sasaki), board a time shuttle and travel back to 1944 to Lagos Island. There, as American forces land and engage the Japanese forces commanded by Shindo, the dinosaur attacks and kills the American soldiers. The American navy then bombs the dinosaur from the sea and gravely wounds it. After Shindo and his men leave the island, M-11 teleports the dinosaur from Lagos Island to a place in the Bering Strait. Before returning to 1992, the Futurians secretly leave three small creatures called Dorats on Lagos Island, which are exposed to radiation from the hydrogen bomb test in 1954 and merge to become King Ghidorah, which then appears in present-day Japan. After returning to 1992, the Futurians use King Ghidorah to subjugate Japan. They issue an ultimatum, but Japan refuses to surrender. Feeling sympathy for the Japanese people, Emmy reveals to Terasawa the truth behind the Futurians' mission: in the future, Japan is an economic superpower that has surpassed the United States, Russia, and China. The Futurians traveled back in time in order to change history and prevent Japan's future economic dominance by creating King Ghidorah and using it to destroy present day Japan. At the same time, they also planned to erase Godzilla from history so it wouldn't pose a threat to their plans. After M-11 brings Emmy back to the UFO, she reprograms the android so it will help her. With M-11 and Terasawa's aid, Emmy sabotages the UFO's control over King Ghidorah. At the same time, Shindo plans to use his nuclear submarine to recreate Godzilla. En route to the Bering Strait, Shindo's submarine is destroyed by Godzilla, who absorbs its radiation and becomes larger and more powerful. Terasawa discovers that a Russian nuclear submarine sank in the Bering Strait in the 1970s and released enough radiation to mutate the dinosaur into Godzilla. Godzilla arrives in Japan and is met by King Ghidorah. They fight at equal strength, each immune to the other's attacks. Godzilla eventually ends the battle by blasting off Ghidorah's middle head. Before the final blow, Godzilla destroys the UFO, killing Wilson and Grenchiko. Godzilla then turns its attention on Tokyo, destroying the city and killing Shindo. Emmy travels to the future with M-11 and returns to the present day with Mecha-King Ghidorah, a cybernetic version of King Ghidorah. The cybernetic Ghidorah blasts Godzilla with energy beams, which proves useless. Godzilla then counters by relentlessly blasting Ghidorah with its atomic ray, almost decapitating Ghidorah. Ghidorah survives but Godzilla prevails, knocking Ghidorah down. Emmy carries off Godzilla and drops it and Ghidorah into the ocean. Emmy then returns to the future but not before informing Terasawa that she is his descendant. At the bottom of the ocean, Godzilla awakens and roars over Ghidorah's remains before swimming away. Although the previously filmed Godzilla vs. Biollante had been the most expensive Godzilla film produced at the time, its low audience attendance and loss of revenue convinced executive producer and Godzilla series creator Tomoyuki Tanaka to revitalize the series by bringing back iconic monsters from pre-1984 Godzilla movies, specifically Godzilla's archenemy King Ghidorah. Godzilla vs. Biollante director and writer Kazuki Ōmori had initially hoped to start a standalone series centered on Mothra, and was in the process of rewriting a 1980 script for the unrealized film Mothra vs. Bagan. The film was ultimately scrapped by Toho, under the assumption that, unlike Godzilla, Mothra would have been a difficult character to market overseas. The planning stages for a sequel to Godzilla vs. Biollante were initially hampered by Tanaka's deteriorating health, thus prompting the takeover of Shōgo Tomiyama as producer. The new producer felt that the financial failure of Godzilla vs. Biollante was due to the plot being too sophisticated for child audiences, and thus intended to return some of the fantasy elements of the pre-1984 Godzilla films to the series. Ōmori himself blamed the lackluster performance of Godzilla vs. Biollante on competition with Back to the Future Part II, and thus concluded that audiences wanted plots involving time travel. His approach to the film also differed from Godzilla vs. Biollante in his greater emphasis on developing the personalities of the monsters rather than the human characters. Akira Ifukube agreed to compose the film's score on the insistence of his daughter, after as he was dissatisfied with the way his compositions had been treated in Godzilla vs. Biollante. The Godzilla suits used in Godzilla vs. Biollante were reused in Godzilla vs. King Ghidorah, though with slight modifications. The original suit used for land-based and full body shots had its head replaced with a wider and flatter one, and the body cut in half. The upper half was used in scenes where Godzilla emerges from the sea and during close-ups during the character's first fight with King Ghidorah. The suit used previously for scenes set at sea was modified with rounder shoulders, a more prominent chest, and an enhanced face, and was used throughout the majority of the film's Godzilla scenes. The redesigned King Ghidorah featured much more advanced wirework puppetry than its predecessors, and effects team leader Koichi Kawakita designed the "Godzillasaurus" as a more paleontologically accurate-looking dinosaur than Godzilla itself as a nod to American filmmakers aspiring to direct their own Godzilla films with the intention of making the monster more realistic. Ōmori's original draft specified that the dinosaur that would become Godzilla was a Tyrannosaurus, though this was rejected by creature designer Shinji Nishikawa, who stated that he "couldn't accept that a tyrannosaur could become Godzilla". The final suit combined features of Tyrannosaurus with Godzilla, and real octopus blood was used during the bombardment scene. 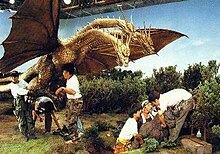 Because the Godzillasaurus' arms were much smaller than Godzilla's, suit performer Wataru Fukuda had to operate them with levers within the costume. The creature's distress calls were recycled Gamera cries. The Columbia/TriStar Home Video DVD version was released in 1998 as a single disc double feature with Godzilla vs. Mothra. The picture was full frame (1.33:1) [NTSC] and the audio in English (2.0). There were no subtitles. Extras included the trailer for Godzilla vs. King Ghidorah and Godzilla vs. Mothra. The Sony Blu-ray version was released on May 6, 2014 as a two-disc double feature with Godzilla vs. Mothra. The picture was MPEG-4 AVC (1.85:1) [1080p] and the audio was in Japanese and English (DTS-HD Master Audio 2.0). Subtitles were added in English, English SDH and French. Extras included the theatrical trailer and three teasers in HD with English subtitles. Joseph Savitski of Beyond Hollywood said "This entry in the popular monster series is a disappointing and flawed effort unworthy of the “Godzilla” name." WatchMojo ranked it as the #2 best Godzilla Movie. The film was considered controversial at the time of its release, being contemporary to a period of economic tension between America and Japan, but mainly due to its fictional World War II depictions. Gerald Glaubitz of the Pearl Harbor Survivors Association appeared alongside director Kazuki Ōmori on Entertainment Tonight and condemned the film as being in "very poor taste" and detrimental to American-Japanese relations, allegations that Ōmori denied, stating that the American extras in the film had been "happy about being crushed and squished by Godzilla." Ishirō Honda also criticized Ōmori, stating that the scene in question went "too far". ^ a b c Kalat, David (2010). A Critical History and Filmography of Toho's Godzilla Series (2nd ed.). Jefferson, North Carolina: McFarland & Co. pp. 179–183. ISBN 9780786447497. ^ a b Ryfle, Steve (1998). Japan's Favorite Mon-star: The Unauthorized Biography of "The Big G". Toronto: ECW Press. pp. 265–275. ISBN 1550223488. ^ a b c Wong, Kin Yuen (2005). World Weavers: Globalization, Science Fiction, and the Cybernetic Revolution. Hong Kong: Hong Kong University Press. p. 182. ISBN 9789622097216. Retrieved 29 November 2015. ^ "Godzilla vs. King Ghidorah Blu-ray". Blu-ray.com. 2014-05-01. Retrieved 2014-07-07. ^ Savitski, Joseph (2004-08-04). "Godzilla vs King Ghidorah (1991) Movie Review". Beyond Hollywood. Wayback Machine. Archived from the original on 26 August 2017. Retrieved 2017-03-13. ^ "Top 10 Godzilla Movies". WatchMojo. YouTube. 26 Feb 2014. Retrieved 2017-03-13. ^ "Godzilla vs. King Ghidorah (1991) - CNN Report". YouTube. Retrieved 2014-07-16.